From 9 to 14 April 2019 a choral exhibition brings together projects and collections from twenty-two exhibitors, more than sixty-five designers from the international scene from eleven countries. 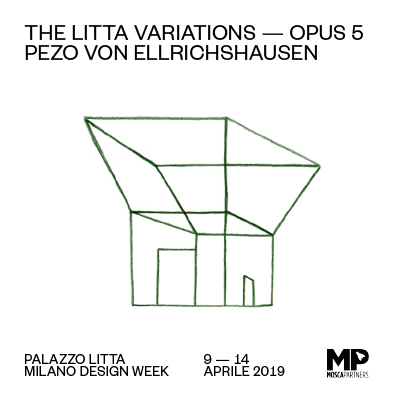 On the occasion of the Milan Design Week 2019, a historic residence in the heart of the city of Milan will host The Litta Variations / Opus 5, curated by MoscaPartners. The focus in the Main Courtyard is on the Pezo von Ellrichshausen studio, founded in 2002 by Mauricio Pezo and Sofia von Ellrichshausen in the city of Concepción, in southern Chile. Their existential matrix interventions reach completeness with the place in which they are found, to reveal an updated dialogue between nature and architecture. 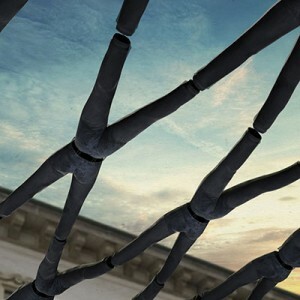 In 2008, they oversaw the Chilean pavilion at the Architecture Biennale in Venezia, also taking part in 2010 and 2016. In addition, they exhibit their projects at the Royal Academy of Arts in London and have become part of the permanent collection at the Art Institute in Chicago and MoMA, the Museum of Modern Art in New York . Alongside their concept and design work, they have teaching commitments at universities in Chile and the United States, including Harvard and Cornell Universities . Sofia von Ellrichshausen was also president of the jury at the last Architecture Biennale in Venezia. 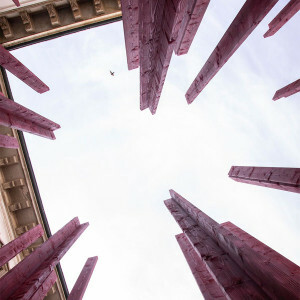 At Palazzo Litta the studio will present Echo, a mysterious object that inspires a sensitive adherence between the interior and exterior settings. The pavilion puts Man in the centre, simultaneously the subject and source of contemplation. 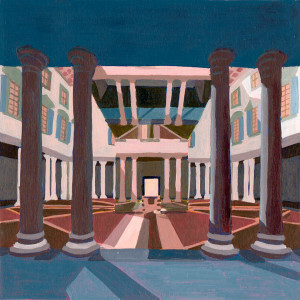 The exterior of Echo , covered with a mirrored surface , reflects the baroque colonnade and the two upper orders that make up the courtyard of the building. In contrast, the interior reveals the sky, a natural element isolated from the city. The result of this exploration is the definition of architecture perceived as a shared and reflective experience, imposing and immersed in the setting. The installation establishes a relationship between art and architecture announcing the surrounding environment through a visual echo. Piero Gandini (Chairman of Design Holding and CEO of Flos) shared and strongly believed in the project, personally acquiring the work by the Chilean architects and committing himself to giving them design continuity. 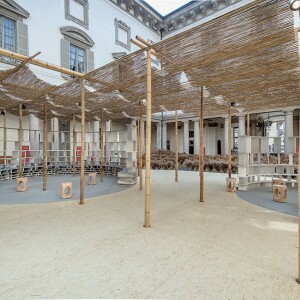 For the first time, the installation at the Main Courtyard crosses the spatial boundaries of the Palazzo and the temporary ones of the Milan Design Week: since its beginnings, Echo was conceived as a permanent work, intended to persist over time. Flos , a leader in the manufacture of high-end lighting objects and systems, is the technical partner for lighting the exterior spaces and the Echo installation. Thanks to its specific expertise in the sector and to the innovative technology in the Architectural and Outdoor collections, Flos has developed a lighting project that integrates with the exterior spaces of the Main Courtyard and the arcade, thus contributing to the poetic purity of the work. B&B Italia , a leading Italian group in high-end designer furniture, has supplied a series of twenty-two PAC benches in brushed white oak, specifically made for this installation. The installation will be done by the technical partner, De Castelli, Metal Projects Factory, known for its expertise in high craftsmanship: the constant research into and experimentation with metal has led the company to establish itself on the international stage and to take on important collaborations from which prestigious architecture and special projects have been created. Salvatori will contribute as a technical partner on the Echo installation with seating in natural stone designed by the Pezo von Ellrichshausen studio. The involvement of Salvatori in the project, with the creation of design accessories from the impeccable line, is in complete harmony with the installation, accentuating its beauty. Designers, companies, brands and universities with an international scope will interpret the 17th century Palazzo’s Piano Nobile , expanding the exhibition boundaries in the Clock Courtyard, in the Theatre and in the Foyer displaying the latest collections and research. partnership with TIPTOE and made possible with support from Elitis, Cosentino and Adm. In the passageway between the courtyard and the staircase to the upper storey, AlvinT presents his latest works inspired by his native culture and its traditional materials. The products are made entirely by hand and designed by Alvin Tjitrowirjo who uses Karuun rattan for greater strength and surprising aesthetics. Alp Design uses simple and elegant products designed to last to express its philosophy. Designer Annick L. Petersen creates objects with an architectural feel that harmonise with the linear and soft materials, creating versatile combinations and environments with significant customisation possibilities. The carpet company, Jaipur Rugs , and the Italian designer, Matteo Cibic , accompany the viewer on an experiential journey in Rajastan, through the weaves of products made by hand: Jaipur Wunderkammer is an installation that takes on the semblance of a museum, a room within a room, a collection of colours and shapes that overlap.. The participation of Japan Creative, a non-profit organisation created to enhance and publicise the Japanese product linked to artisan tradition through twenty-four collaborations with leading international designers, offers an overview on the latest projects, JC23 CONDE HOUSE for Raw-Edges and JC24 Kiriyama Glass Works for Formafantasma. LITHEA presents Innesti Mediterranei / Living , a set by Martinelli Venezia Studio which showcases new products from the Sicilian company: a collection of living accessories from the collaboration with the designers Elena Salmistraro and Martinelli Venezia , which evokes the special link with the Mediterranean. Dooor , the debut brand from an Italian company which has specialised in the manufacture of fabrics for over fifty years, presents the installation, Walk out the dooor by Calvi Brambilla that summarises the extraordinary functional characteristics of the product and expands its aesthetic horizons thanks to new printing techniques and the use of highly technological covering materials. Atelier de Troupe is a creative studio based in Los Angeles founded by Gabriel Abraham, former set designer for the cinema. Creating object with a strong evocative power, the designer was inspired by the imaginary décor of the twentieth century and his icons. The installation evokes the noir atmospheres of Robert Altman’s cinema, through the selection of different materials such as chrome-plated steel, leather and glass. a strong material stamp to some iconic elements in the first collection, designed by Matteo Fiorini, Martina Bartoli and Serena Confalonieri. Climbing the Scalone d’Onore, the Piano Nobile can be explored with its many settings where the installation and the design products harmonise with the Palazzo’s rich rooms. designer Defne Koz in The Theater of Food exhibition: from the dialogue with important chefs come dishes and accessories for the table which become the set and the actors, a stage for the recipes that make up the theatre daily. The Sala degli Specchi (hall of mirrors) will be completely redefined by Cove , an exhibition that presents new products made by the British furniture brand, Allermuir , designed by Benjamin Hubert, the founder of LAYER. Allermuir and LAYER have transformed the room into a visually light space with interconnected minimal structures draped in Kvadrat fabrics that contribute to creating a suffused setting. Kawashima Selkon Textiles , with headquarters in Kyoto, has been a renowned, global name in fabric manufacturing for 176 years. For the first time at the Milan Design Week, it presents in the Craft ⇄ Industry exhibition, one of the most symbolic motifs from the Rimpa school of art, Hyakka – literally One hundred flowers . Designed by the painter and designer Kamisaka Sekka, Hyakka is stated in the materials woven with various techniques, from traditional Japanese arts to the latest industrial technologies. Kober is a German company with over one hundred years of experience in technical ceramics and that, in the Enter Porcelain exhibition will dialogue with Olivari , a well-known Italian manufacturer of door handles. They will exhibit the handle conceived by eleven German design studios and an overview of porcelain manufacturing methods will be given. A.X.A.P. as extra as possible is the name of the installation of XL EXTRALIGHT® and the SCUOLA POLITECNICA DI DESIGN SPD, designed by the Matteo Ragni Studio . The project is linked to a play on words – as extra as possible – as light as possible – as comfortable as possible – as unique as possible : the projects by the SPD students bring out the extraordinary versatility of the XL EXTRALIGHT® material and its application in new, unexplored fields. The exhibition of Murano glass objects designed for Arcade by Ivan Baj and Marcello Panza is titled, Impronte , in reference to the processing procedures which start with the author’s sign-mark and is completed through the manual work of the craftsmen and women who make each single piece in the glassworks. Glasshouse of Textiles takes the house prototype in its most ancestral form that, here, becomes a work of art: placed in the centre of a small room, the installation is imposing for its powerful dimensions and it integrates into the environment, become a home in the home . The result is a play on full and empty spaces, transparencies and veiling through the texture of a designer product applied to the glass in five colours. ARTMINING MILAN 2019 is a project aimed at promoting Korean artists internationally through the search for new opportunities to publicise and share their work: twenty-six creatives will, in a unique setting, exhibit works of contemporary art, crafts and design from Korea. Crowning the research on design in the automotive field, Jaguar will present The Future Legacy in the Cortile dell’Orologio. The creative concept expresses the brand’s renewed stylistic identity. A discovery path plays with perspective and mirrored surfaces, fragmenting, reconstructing and finally revealing the new Jaguar XE. In the Litta Theatre, the Swiss foundation for culture, Pro Helvetia under the brand Design Switzerland presents a selection of eleven young design studios: AATB, Valentin Dubois, Matthieu Girel, Douma Guittet, Xénia Lucie Laffely, Bertille Laguet, Somniacs, Studio 5, Studio Ilio, Studio Porto and Reto Togni. In the Foyer, the Brazilian brand, Sollos , for the second time at Palazzo Litta, presents Good News from Brasil, an exhibition created by the artistic director and designer Jader Almeida who, focusing on elegant, light materials, presents a selection of items that give life to an installation with a museum atmosphere. The Litta Variations / Opus 5 is backed by important partners that enrich both the proposal and the services. Technical partner Kartell , a company founded in Milan in 1949 by Giulio Castelli that has symbolised Italian design for 70 years, will provide Generic C chairs designed by Philippe Starck and Multiplo tables by Antonio Citterio in the Cortile dell’Orologio. 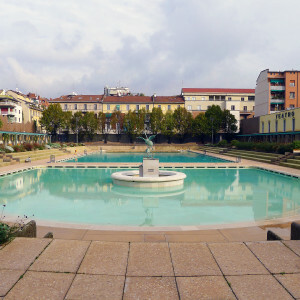 Technical partner Euroambiente , a member of the Zelari group operating in the landscape sector for the design, creation and management of green works, will enhance the Cortile dell’Orologio with trees and plants. The official booking partner for the event is Musement , a multi-platform operator for researching and booking tours and attractions throughout the world, and which will support the booking and registration services. Thanks to the recognised experience in the sector, this year, visitors will be able to book their visit in advance, making entry to the event faster and easier throughout the entire Milan Design Week 2019. The collaboration with Palazzo Litta – the headquarters of the MiBAC Regional Secretariat for Lombardy – is renewed for the sixth year, with special thanks.